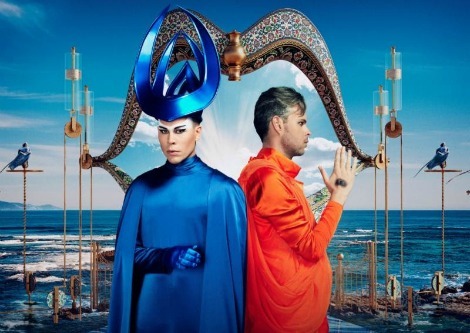 Alt-electro pioneers Empire Of The Sun today invite us into their trippy garden of unearthly bliss as they share the video for their track “High and Low”. The track is lifted from the forthcoming third studio album, Two Vines, set for release on October 28th via Astralwerks. Directed and produced by Empire Of The Sun in partnership with Roof Studios, Sunset and Bill Yukich, the video for “High and Low” is a psychedelic journey through space and time, through a waterfall of dreams, beyond the white light of an ice curtain where in lies a lush, green world where an intricate living forest and ancient wisdom form to create an out of body experience. “Imagination is something that we’ve always nurtured and promoted and however one achieves that ecstatic madness of being is fine. It can be love to some people, it can be taking a walk in nature, or it can be scaling the heights of a psychedelic experience. As artists we like to live on the edge. I guess this song is about finding some equilibrium there.” says Nick Littlemore of the track.